China launched its second data relay satellite Monday, expanding the country's space communications network before the first Chinese space docking attempt later this year. 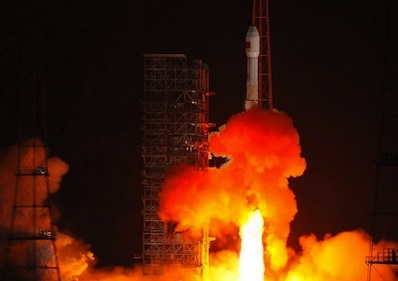 The spacecraft blasted off at 1541 GMT (11:41 a.m. EDT) Monday on the tip of a Long March 3C rocket. The launch was at 11:41 p.m. local time at the Xichang space center in Sichuan province in southwest China, according to the China Academy of Launch Vehicle Technology. The 18-story rocket successfully released its payload a few minutes after liftoff. The payload was the second Tianlian 1 data relay satellite, joining a similar craft launched in April 2008. The satellites are part of a network to increase the coverage of tracking stations for Chinese space missions across the globe, according to the Xinhua news agency, a state-run outlet. According to U.S. tracking data, the Tianlian spacecraft was deployed in an orbit stretching from a low point of 120 miles to a high point of more than 26,000 miles. The orbit's inclination is 18 degrees. On-board engines will fire several times to place the satellite in a circular orbit about 22,300 miles over the equator. The Tianlian communications system will be instrumental in China's attempt to dock two unmanned spacecraft this fall, Xinhua reported. China plans to launch a 19,000-pound space laboratory module by the end of September, and an unmanned Shenzhou capsule flying on autopilot will dock several weeks later, forming the country's first mini-space station. Without the Tianlian satellites, China's previous human space expeditions relied on ground stations covering about 12 percent of each orbit. The data relay satellites increase the coverage to more than half of a spacecraft's circuit around Earth. The first Tianlian spacecraft launched several months before China's Shenzhou 7 mission flew three astronauts into orbit and accomplished the military-run program's first spacewalk. Monday's mission was China's fourth space launch this year, and it marked the 32nd rocket flight worldwide to reach orbit in 2011.